Following her recordings of 18th-century French chamber music, the violinist Florence Malgloire scrolled further back to Charpentier, who composed relatively few, albeit extremely interesting, stand-alone instrumental works. The principal instrumental work here is the tantalising Sonate à huit, a work that has been slow to gain popularity, despite a fine recording by London Baroque as long ago as 1986 (Harmonia Mundi, 5/87). 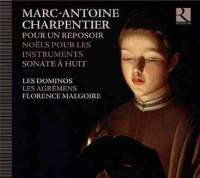 To judge by the paper on which he copied the parts, Charpentier composed the Sonate in the mid-1680s as a showpiece for four solo players and accompanying instruments, and to impress a Paris audience of connoisseurs, who would take delight in the various juxtapositions of current French and Italian styles within it. Les Dominos do it proud, though I was sorry to detect the pauses between some of the movements – something Charpentier specifically warned against. This disc has the feel of an Advent concert because it includes both liturgical music and Noëls, brings together three separate ensembles, and relies on a characterful organ (after Le Picard) played by the talented Freddy Eichelberger, the attractions of a serpent played by Patrick Wibart and the luxuriant acoustics of the Abbaye aux Dames at Saintes. The evocation of the procession of the Holy Sacrament to the Altar of Repose is quite realistic, with the two verses of plainchant interleaved with the instrumental music (a rare treat to hear). The serpent quite rightly and very effectively supports the baritones from the Namur Chamber Choir but slightly weighs down the delicate chamber music textures. Of the Noëls, some are performed in both simple vocal and imaginatively orchestrated instrumental versions, and it is here that Eichelberger puts the organ through its paces (the birdsong effects in tr 19 are especially intriguing). Malgloire takes a well-deserved bow in ‘O nous dite Marie’ (tr 15). Definitely to be revisited next Christmas, if not before.